InsideHigherEd.com—an online trade publication for higher education—released today its own picks for the NCAA Women’s Basketball Tournament Bracket based solely on academic standards, and Nashville’s Belmont Bruins landed in the Elite Eight of the Tournament before being beaten by the University of Texas. On the road to the Championship, Belmont “defeated” some fellow academic powerhouses, includingMichigan State, Chattanooga and Seton Hall. The Inside Higher Ed website annually completes an NCAA bracket based on each team’s academic performance, with teams in the bracket “competing” based on Academic Progress Rate (APR) scores, the NCAA’s multi-year measure of a team’s classroom performance. If teams tie on APR, Inside Higher Ed then moves to Graduation Success Rate, which measures the proportion of athletes on track to graduate within six years. Belmont’s women’s basketball program finds itself among the nation’s elite academically. In the second year of the Cameron Newbauer era, the Bruins rocketed into the top 15 of the Women’s Basketball Coaches Association (WBCA) Academic Top-25 team honor roll, the only school representing the state of Tennessee on the elite list for the 2014-15 academic year. Across the board Belmont Athletics is known for its commitment to academic success with the men’s basketball team winning the Inside Higher Ed Academic Bracket in 2013 and last year. In addition, the University has claimed its conference’s all academic award 12 of the past 14 years. Belmont defeated Eastern Kentuky, 95-63, March 5 to claim the 2016 Ohio Valley Conference Women’s Basketball Championship and an automatic bid to the 2016 NCAA Women’s Basketball Tournament. The 32-point margin of victory was the largest in OVC Women’s Basketball Championship history, and the Bruins (24-8) have won 16 of their last 17 games. This is only the second time in program history that Belmont women’s basketball has earned a trip to the Big Dance, the first coming in 2007. 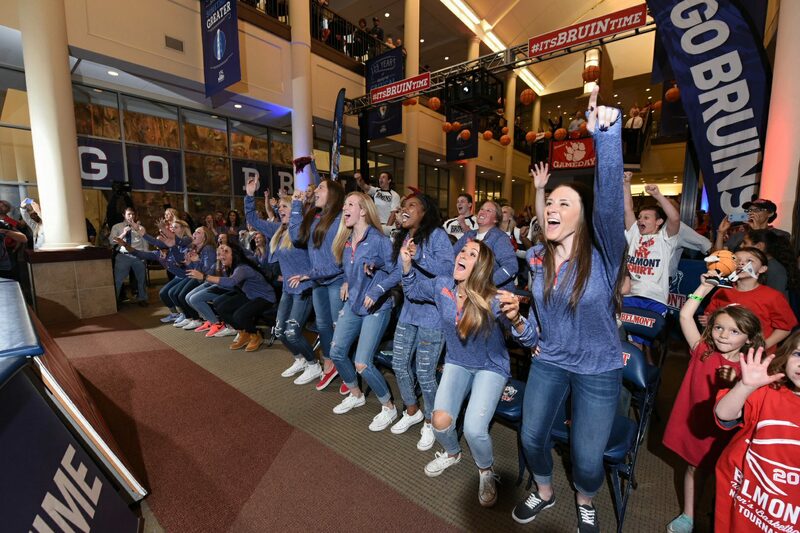 Belmont learned on “Selection Monday” that its No. 13 seed women’s basketball team will face the No. 4 Michigan State Spartans on Friday, March 18 in the first round of the 2016 NCAA Women’s Basketball Tournament. Tip-off time is 11 a.m. Central from Humphrey Coliseum at Mississippi State University, and a Watch Party on Belmont’s campus is currently being planned that will be free and open to the public to attend. The game will be broadcast live on ESPN2.